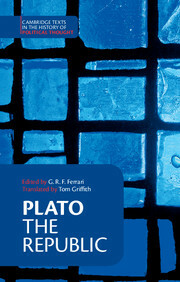 Plato's Laws is one of the most important surviving works of ancient Greek political thought. It offers sustained reflection on the enterprise of legislation, and on its role in the social and religious regulation of society in all its aspects. Many of its ideas were drawn upon by later political thinkers, from Aristotle and Cicero to Thomas More and Montesquieu. This book presents the first translation of the complete text of the Laws for thirty-five years, in Tom Griffith's readable and reliable English. 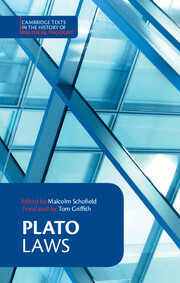 Malcolm Schofield, a leading scholar of Greek philosophy, introduces the main themes and characteristics of the work, as well as supplying authoritative notes on the structure and detail of Plato's argument, together with a guide to further reading. The book will be a key resource for those interested in Greek philosophy and of the history of political thought. Malcolm Schofield is Emeritus Professor of Ancient Philosophy and a Fellow of St John's College, Cambridge. He has been one of the leading scholars worldwide in the study of ancient Greek and Roman philosophy for the last forty years. His many publications in the field of ancient political thought include the path-breaking The Stoic Idea of the City (Cambridge, 1991), and the authoritative The Cambridge History of Ancient Greek and Roman Political Thought (Cambridge, 2000), co-edited with Christopher Rowe. Tom Griffith has published translations of many Platonic dialogues, noted for their combination of easy and natural modern English with faithfulness to the tone and content of the original Greek. 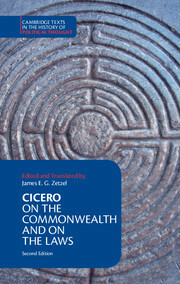 His version of the Republic, coedited with G. R. F. Ferrari (Cambridge, 2000), has been one of the most widely read texts in the Cambridge Texts in the History of Political Thought series. 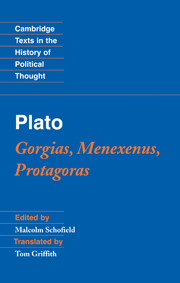 Together with Malcolm Schofield he is also coeditor of another previous series volume, Plato: Gorgias, Menexenus, Protagoras (Cambridge, 2010).